A Great Poison burst forth into the land, clawing at life with such violence that we were ripped from our peaceful state and find ourselves wandering as shadows of the mortal forms we left behind, searching for why we are here. Phazon, referred to as the Great Poison by the Chozo, is an extremely radioactive and dangerous organic substance that can take on many forms. The mutagen is highly poisonous and corrosive, and contact with Phazon will result in immediate death or mutation in seconds. Phazon spreads throughout the galaxy and manipulates organisms with Phazon Corruption. The toxic substance can destroy environments and entire planets. Phazon was first detected on planet Tallon IV, although it has been spreading across the galaxy long before the Corruption of Tallon IV from its planet of origin, Phaaze. The plot of the Metroid Prime series revolves around Phazon and its destructive influence. Not much is known regarding the true nature of Phazon as a material substance. It is highly radioactive, corrosive, and biologically toxic. Phazon has even demonstrated low-level sentience, as evidenced by creatures such as Phazon Grubs and Liquid Phazon, which are entirely Phazon-based. Phazon has been used extensively by the Space Pirates for its effective mutagenic properties, which they have used to mutate their own genetic structure to produce more powerful and monstrous versions of themselves, as well as the genetic structure of other species. These beneficial mutations are limited by a notable decrease in the target bioform's life span, as it deteriorates cellular structure in addition to changing the genetic code. During the course of Samus's visit to Phaaze, the Phazon inside of her even affected her genetic structure to the point where her ship's bio-scanners could not recognize her. Some 50 years prior to the events of Metroid Prime, a meteor infected with Phazon struck the planet Tallon IV, causing great devastation and forcing the Chozo colonists who survived to flee. Before abandoning the planet, the Chozo attempted to contain the spread of Phazon on the planet at the impact site by means of a Cradle and Cipher. At the heart of the impact site was a Metroid specimen whose exposure to raw Phazon radically mutated it. It became the subject known as Metroid Prime. After its defeat by Samus Aran, Metroid Prime ensnares her Phazon Suit and uses it and parts of Samus's own DNA to eventually become the organism known as Dark Samus. Around this same time, Space Pirates discovered Phazon and began mining operations of high-yield sites and experimention with its biomutagenic properties. Samus first encounters Space Pirates using Phazon in this way on the Frigate Orpheon, where mutations of native Parasites resulted in Parasite Queens. 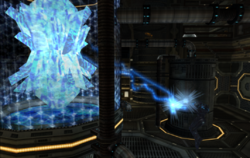 Initial experiments were made on Tallon Metroids in the Glacier One outpost in Phendrana Drifts, which the Space Pirates planned to use as weapons and power sources. Tests yielded such results as Hunter Metroids and Fission Metroids. Later experiments, such as Project Titan, which focused on the mutation and animation of inanimate objects, resulted in the specimen Thardus before it was completely shut down. Project Helix, which aimed to mutate Space Pirate DNA with Phazon, finally succeeded when the Phazon Strain Vertigo was discovered by Research Team Sclera and several specimens, including Elite Pirates, a Phazon Elite, and the Omega Pirate, survived to maturity. Phazon was first introduced to the planet Aether at the beginning of the Luminoth Dark Age. A Leviathan impacted the planet, sending it into a state of Transdimensional Flux that ultimately resulted in the creation of Dark Aether and the Ing. Space Pirate Science Teams detected the presence of Phazon in the Dasha System seven cycles prior to Samus's arrival and established a base on the planet. Expeditions through a dimensional rift revealed that Dark Aether contained vastly superior deposits of Phazon than its light counterpart and extraction missions were soon conducted regularly. Metroid Prime, reborn as Dark Samus and mistaken for Samus Aran by the Space Pirates, soon began raiding their base and stealing Phazon for her own purposes. Dark Samus eventually absorbs so much Phazon energy that she becomes a being of pure yet unstable Phazon. Following the destruction of Dark Aether and the Ing, a Galactic Federation vessel, the G.F.S. Anhur, returned to Aether to assist the Luminoth in dismantling the Space Pirate mining facility. Several kilograms of Phazon ore recovered during this time later led to the development of the Phazon Enhancement Device. This section of the page is incomplete or missing. You can help Metroid Wiki by expanding it. Dark Samus, reformed in the Phazon storage of the Space Pirate vessel Colossus, took control of the Space Pirate crew and then ventured alone to Phaaze. From there, she sent a Leviathan seed to the Pirate Homeworld, which was gradually corrupted. Afterwards, she sent Leviathans hurtling towards the Federation planets Bryyo, Elysia, and Norion. This crate appears to be the same type of container found on the Space Pirate research frigate. The material seeping out from the ruptured metal is highly toxic. Analysis indicates this may be the 'Phazon' compound the Space Pirates were using in their biological experiments. Volatile ore with biomutagenic properties. Origin point of Phazon unknown. First detection of element on planet Tallon IV. Used by Space Pirates to produce vast levels of energy. Bioforms exposed to Phazon without proper shielding will eventually undergo radical mutation. ↑ 8.0 8.1 "Planet Aether, home of the Luminoth, was struck by a “Phazon Meteor” five decades ago. The impact had catastrophic effects on the already unstable planet, creating a “dark twin” of the planet and a fierce race known as the Ing. A brutal war between the twin planets took place, with the Ing gaining the upper hand. The G.F.S. Tyr went to the sector to investigate pirate activity, but were forced to make an emergency landing on Aether. Shortly after, the entire crew of Tyr was attacked and annihilated by the Ing. Hunter Samus Aran was sent to investigate, and wound up entangled in the local conflict. Aran fought against both Space Pirates and Ing, and arose victorious. Aether’s “dark twin” vanished, taking with it the Ing horde, and the planet’s peace was finally restored. Acid Rain · Dark Water · Fuel Gel · Vaccine "Metroid"
This page was last edited on 2 April 2019, at 16:10. This page has been accessed 52,742 times.